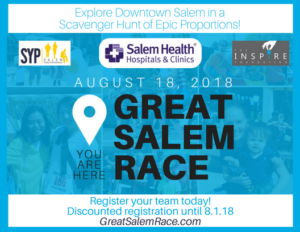 Join us for the 2018 Great Salem Race! August 18, 2018 – Team up with your coworkers, friends or family for the ultimate team building event of the year! Costumes are encouraged! Explore downtown Salem in a scavenger hunt of epic proportions. It’s a great opportunity for your business too!